Silver Spring, Md. (Tuesday, November 27, 2018) – Sony Pictures Entertainment and Discovery Education, the leading provider of digital content and professional development for K-12 classrooms, today announced Discover the Spider-Verse – an action-packed, STEM and literacy Virtual Field Trip experience, created to offer middle and high school students nationwide a sneak peek of the science, technology, engineering and math found in the new Spider-Man™: Into the Spider-Verse movie. Premiering as the first-ever movie studio inspired Virtual Field Trip experience on Thursday, November 29, 2018 at 1:00 p.m. ET/10:00 a.m. PT, Discover the Spider-Verse will spotlight how Discovery Education’s 4Cs STEM skills framework – collaboration, communication, creativity and critical-thinking – are vital components of filmmaking. Students will transcend the walls of their classrooms, to blast into a multiverse with the creators of the new film, while learning important lessons from the Spider-Verse. Educators, parents and school communities are invited to register for the event at DiscoverTheSpiderverse.com. 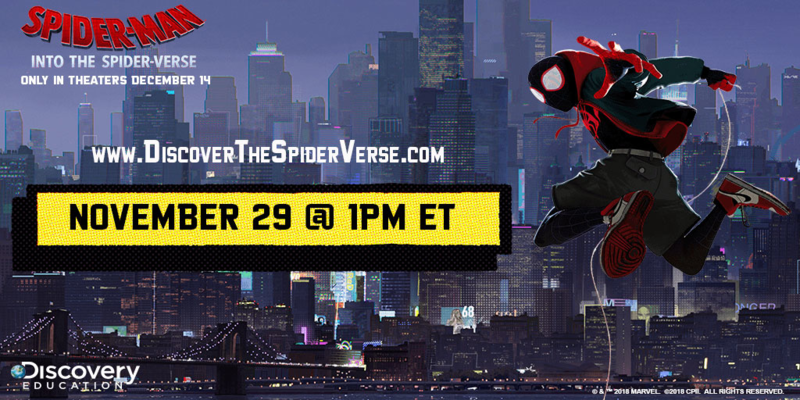 Participants are also encouraged to join a LIVE Discover the Spider-Verse Twitter chat @DiscoveryEd and @SpiderVerse during the Virtual Field Trip using #DiscoverTheSpiderverse. The Discover the Spider-Verse Virtual Field Trip will offer a unique experience that leverages immersive content from the new Spider-Man™: Into the Spider-Verse movie, including: STEM and literacy classroom guides, and a family viewing guide, to give young learners an opportunity to engage in applied STEM and literacy learning. The STEM guide will invite students to connect scientific concepts presented in the film to their own lives. The literacy guide will examine characters in the film, and how a variety of backgrounds and perspectives can influence decision-making. As well, Discover the Spider-Verse family activities will extend learning and key messages from the film to facilitate a dialogue beyond the classroom walls. To sign up for the Virtual Field Trip experience and to access Discover the Spider-Verse free resources, visit DiscovertheSpiderverse.com. For more information about Discovery Education’s digital content and professional development services, visit www.discoveryeducation.com. Stay connected with Discovery Education on Facebook, Twitter, Instagram and Pinterest @DiscoveryEd. Phil Lord and Christopher Miller, the creative minds behind The Lego Movie and 21 Jump Street, bring their unique sensibilities to a fresh version of a different Spider-Man Universe, with a groundbreaking visual style that’s the first of its kind. Spider-Man™: Into the Spider-Verse introduces Brooklyn teen Miles Morales, and the limitless possibilities of the Spider-Verse, where anyone can wear the mask. Columbia Pictures presents in association with Marvel an Avi Arad/Lord Miller/Pascal Pictures production a Sony Pictures Animation film, Spider-ManTM: Into the Spider-Verse. Featuring the voices of Shameik Moore, Jake Johnson, Hailee Steinfeld, Mahershala Ali, Brian Tyree Henry, Luna Lauren Velez, Lily Tomlin, John Mulaney, Kimiko Glenn, with Nicolas Cage and Liev Schreiber. Directed by Bob Persichetti, Peter Ramsey and Rodney Rothman, the screenplay is by Phil Lord and Rodney Rothman from a story by Phil Lord based on the Marvel Comics. The film is produced by Avi Arad, Amy Pascal, Phil Lord, Christopher Miller and Christina Steinberg. Stan Lee, Brian Michael Bendis and Will Allegra serve as executive producers. Sony Pictures Entertainment (SPE) is a subsidiary of Sony Entertainment Inc., which is a subsidiary of Tokyo-based Sony Corporation. SPE’s global operations encompass motion picture production, acquisition, and distribution; television production, acquisition, and distribution; television networks; digital content creation and distribution; operation of studio facilities; and development of new entertainment products, services and technologies. SPE’s Motion Picture Group production organizations include Columbia Pictures, Screen Gems, TriStar Pictures, Sony Pictures Animation, Stage 6 Films, AFFIRM Films, and Sony Pictures Classics. For additional information, visit sonypictures.com/corp/divisions.html. Sony Pictures Animation produces a variety of animated and family entertainment for audiences around the world, including comedy hit franchises such as The Smurfs, Cloudy with a Chance of Meatballs, and Hotel Transylvania. The division’s most recent theatrical blockbuster, Hotel Transylvania 3: Summer Vacation, is now available on Digital HD and on Blu-ray™ Combo Pack & DVD. Next for Sony Pictures Animation are the groundbreaking animated feature Spider-Man: Into the Spider-Verse from the minds of Phil Lord and Christopher Miller in December 2018; the original feature comedy The Mitchells Vs. The Machines in January 2020; and the animated musical Vivo, featuring original songs by Lin-Manuel Miranda, in November 2020. Sony Pictures Animation, which was founded in 2002, is a division of the Sony Pictures Motion Pictures Group.